The Incredibly True Adventures of an EdTech Trailblazer: The New JCHS Library Media Team: Ready to Connect, Share, Learn & Grow with YOU! 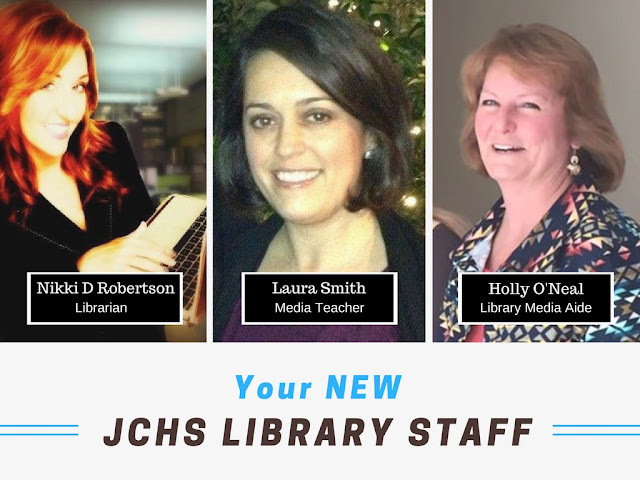 The New JCHS Library Media Team: Ready to Connect, Share, Learn & Grow with YOU! It is with great pleasure that I take this opportunity to introduce the new JCHS Library Media Team: Ms. Laura Smith, Ms. Holly O'Neal, and myself. James Clemens High School has a rapidly growing school population. With our current student numbers, James Clemens High School has received Foundation Funding from the state department specifically earmarked to provide students with a certified school librarian, a second certified librarian and/or a "tech" related person, and a school library media aide. I am grateful to Dr. Fowler and Dr. Clayton for recognizing and facilitating the changes needed to accommodate this student growth. To best serve the needs of students and teachers we have split up our main responsibilities. We look forward to serving the needs of JCHS students, teachers, and administration this school year. We Got the Beat! Yeah! We Got the Beat!